In literature, as in the above quote from Shakespeare’s King Lear, the fool is used as a symbol of common sense and honesty. He is given a license to speak freely and even to mock the court and even the king. While other ‘better’ placed people could give the same advice, they are often too scared of the reaction and the potential impact on themselves to say anything. So while in some ways the lowest member of the court, a jester could be one of a monarch’s most useful advisers and thereby actually be afforded status and privilege. It is said that Queen Elizabeth I once rebuked one of her fools for not being sufficiently severe with her. Enter – stage left; Paul Birch, an executive who had worked for British Airways for 17 years on everything from mergers to marketing. He had threatened to leave the company on a number of occasions and in 1994 was considering it again. 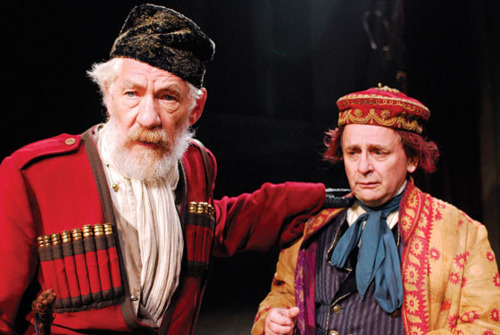 Now Birch had recently read an article on the character of the Fool in King Lear, and decided he would try writing his own a job description for a company fool – someone who would question authority, promote honesty, and approach problems in creative ways. The then CEO Colin Marshall “thought it was a great idea,” Birch says, and he was duly anointed as BA’s first Corporate Jester. The next 18 months of Paul’s career can be described as interesting – but never dull. Birch gave pointers to top BA executives on how to be less confrontational. He made suggestions about the architecture of the company’s headquarters. To promote creativity, he encouraged managers to chase one another with water guns. One specific problem he got involved in was trying to creating a more sensible policy for seat allocation. Under BA’s old system, customers expected to get seat assignments when they made their reservations. But since airlines often overbook flights, customers who made late reservations did not always get assigned seats – even if they were paying full fare. They were forced to wait at the gate with the other passengers who had confirmed seats even though some of them had paid substantially less for their tickets. Not surprisingly some of the full fare paying passengers were getting very angry. Birch wasn’t expected to solve the problem himself but to help BA employees work together as a team and find a solution that would help alleviate the pressure the current system was causing. As part of this, Birch set out to “to change the state of the group” and one approach he used was a game of “Giants, Witches, and Dwarves,” which divides people into three groups. In the end the team redesigned the system so that only tickets bought at a certain price were guaranteed pre-booking of a seat while the remaining majority of customers received their seat allocation at the airport. Footnote: Like other jesters Birch relied on the tolerance and support of his masters and when Bob Ayling took over from Colin Marshall, things changed. Ayling is reported to have said “You’ve been taking the piss for the last year and it’s got to stop.” Birch’s plea that ‘taking the piss’ was what he was supposed to do fell on deaf ears and he was sacked. Birch went on to set up his own company and started playing the fool for other companies. The Stabilo Boss is an unusual pen and an unusual success story. It’s a pen designed to help the reader, not the writer. It’s the world’s best-selling highlighter pen, yet it was wasn’t the first highlighter on the market. Its unique design was the result of an act of frustration. The following year, the Massachusetts based Carter’s Ink developed a similar water-based marker but theirs emitted an eye-catching translucent ink. They called it the Hi-Liter because the see-through yellow and pink inks drew the eye to the text without obscuring what it said. The water- based ink, unlike alcohol-based inks, meant the colour didn’t seep through paper. It wasn’t until 1971 that German pen and pencil manufacturer Schwan Stabilo launched its Stabilo Boss highlighter. Finding the right design however proved to be far from easy. With a brief to find something both practical and revolutionary the in-house designers had design prototype after design prototype rejected. Until one day, after yet another disappointing presentation, one of the designers in a fit of anger and frustration smashed his latest round-bodied clay prototype into his desk, creating an unusual squat trapezium shape. Luckily the designer had calmed down enough to recognise that he might now be onto something. A pen with a round body lets the pen roll and the angle of writing vary according to the writer’s grip. The newly flattened body and squared off nib of the prototype pen encouraged the ‘reader’ to place it flush to the book or desk’s surface. The grip you are ‘forced’ to use is ergonomically conducive to the sideways swipe that characterises the act of highlighting. The shape topped with a bold black lid created the desired revolutionary look setting it apart from other pens and making it instantly recognisable. 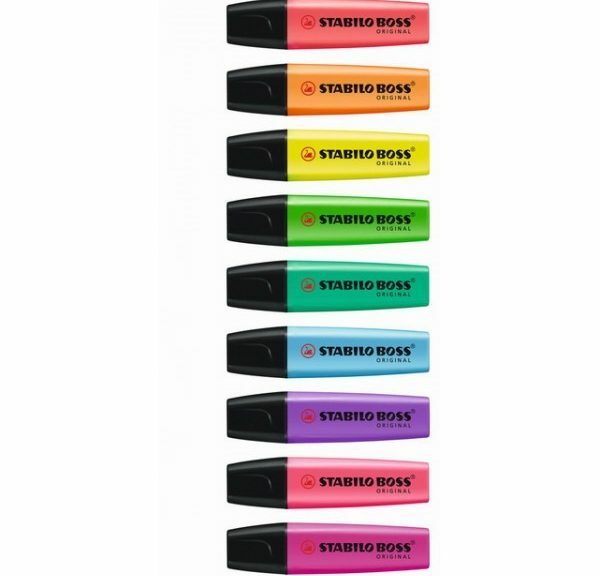 Originally intended for use in the office to highlight important words, the name ‘boss’ seems obvious, though nowadays the highlighter’s use is much wider and especially strong in education where students of all ages use it to highlight key passages in texts. Today 60,000,000 units are produced every year and two are sold every second. One creative thinking prisoner decided he would try and exchange his prison cell for a hospital bed, at least for a few days, so he ‘highlighted’ himself in yellow using a Stablio Boss pen hoping it would give him the appearance of having an attack of jaundice. Unfortunately for him his guards weren’t fooled and all he got was a trip to the showers and not the hospital. “If he had really had such a bad case of jaundice, he would probably have been dead” a prison spokesperson said. “You can choose the typewriter to match your sound signature. Remingtons from the 1930s go THICK THICK. Midcentury Royals sound like a voice repeating the word CHALK. CHALK. CHALK CHALK. Even the typewriters made for the dawning jet age (small enough to fit on the fold-down trays of the first 707s), like the Smith Corona Skyriter and the design masterpieces by Olivetti, go FITT FITT FITT like bullets from James Bond’s silenced Walther PPK. Knowing about his passion, Nerdist Podcast host Chris Hardwick decided to try and short cut the normally long process of tempting a star onto his show and sent Hanks a 1934 Smith Corona typewriter along with a typed invitation to come on the podcast. Please accept this typewriter–o–gram as a formal invitation to be a guest on my wildly-popular-with-the-kids Nerdist Podcast. It is a super relaxed, fun chat that will probably cover comedy, NASA, and whatever else you want to talk about — a new WEBSERIES, perhaps?? We are nice guys who are easy to get along with and have never murdered anyone. Other guests have included folks like your son Colin, Tina Fey, Conan, Jimmy Fallon, Bryan Cranston, John Lithgow, Willem Dafoe, JJ Abrams, Neil Patrick Harris, Neil Degrasse Tyson, Joel McHale, Jon Hamm, and THE MUPPETS. It would be an absolute dream come true to add you to this list. Please accept this 1934 Smith Corona as a gift for even considering this request. It should only VERY SLIGHTLY affect your decision. ’thing’ with this gift of the most fantastic Cornona Silent typewriter made in 1934? 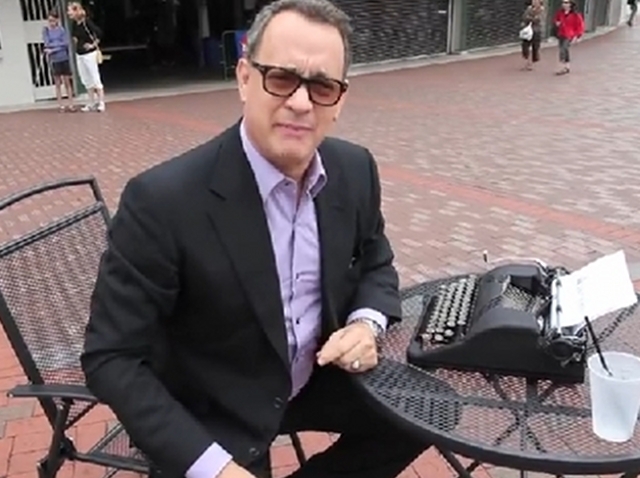 The Hanx Writer is a word processor that simulates the rattle of an old-fashioned typewriter. It includes the option to dispense with a delete key, and to cross out mistakes with XXXXs instead. The basic app is free, but users pay $3 for extra typewriter models and upgrades. Within days of its release, it had risen to the No 1 spot in Apple’s app store in the US. It was 30 years ago (30!) when the world was first introduced to the legendary Apple Macintosh, and 30 years ago the world saw the famous 1984 ad. I’ve used a variety of sources to tell what I hope is a (reasonably) true story of its creation. It may seem almost inconceivable now but one of the most famous ads of all time, the Apple Macintosh 1984 spot, very nearly didn’t run. The story of its route to the Advertising Hall of Fame begins in late 1982 with Apple’s advertising agency, Chiat/Day, working on a print campaign, not for the Macintosh but for its predecessor, the Apple II. The concept was intended to play off George Orwell’s totalitarian vision of the future. “Six months before we (even) knew about Mac, we had this new ad that read, “Why 1984 won’t be like 1984,” creative director, Lee Clow, remembers. The ad never ran and that might have been the end of it had it not been for Steve Hayden, a copywriter, and Brent Thomas, an art director, who in the spring of 1983 were looking for some hook to make a bold statement about the new Macintosh. They remembered the ad and with considerable reworking they put together a storyboard of what would become the 1984 commercial. The storyboard was presented to Apple’s senior marketing team. John Sculley CEO at the time was a bit apprehensive, but Steve Jobs loved it. It was just the sort of radical idea he thought the Mac deserved, so Chiat/Day were given the go-ahead to shoot the commercial and purchase one and a half minutes of airtime during the upcoming Super Bowl. As soon as the rough cut was ready, Chiat/Day presented it to Jobs and Sculley. Jobs loved the commercial and Sculley thought it was crazy enough that it just might work. In October, the commercial was shown at Apple’s annual sales conference and the response was overwhelmingly positive. In late December, marketing manager Mike Murray was tasked with showing the commercial tothe other members of Apple’s Board of Directors: A. C. “Mike” Markkula Jr., Dr. Henry E. Singleton, Arthur Rock, Peter O. Crisp, and Philip S. Schlein. The Board wanted the ad killed and told Sculley he ought to sell back the airtime they had bought. Despite being so close to the date Chiat/Day managed to find a buyer for the 30-second slot immediately but that still left Apple with a 60-second slot for which it had paid $800,000. The backup plan, if they couldn’t find a buyer, was to run ‘Manuals’, a straightforward product-benefit ad. Jobs however still believed in the ad and decided to seek the support of Steve Wozniak, even though Wozniak normally didn’t like to get involved in political issues. 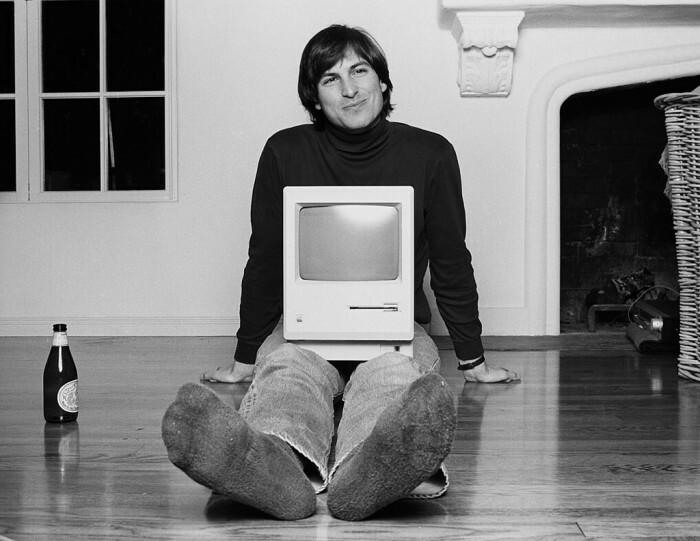 Looking back Wozniak recalled, “One evening I was over at the Macintosh group, which I was about to join, and Steve grabbed me and said ‘Hey, come over here and look at this.’ He pulled up a 3/4-inch VCR and played the ad. I was astounded. I thought it was the most incredible thing. Wozniak’s money wasn’t needed in the end; emboldened with this extra support the marketing team decided to go against the board’s recommendation and air the ad. So on January 22, 1984, the controversial commercial aired to an audience of 96 million early in the third quarter of Super Bowl XVIII. The ad was an immediate sensation and generated an estimated $5 million of extra free publicity. All three television networks and nearly 50 local stations aired stories about the spot, most replaying the ad. Apple fed the media frenzy by announcing that the commercial would never be aired again – which isn’t strictly true. However Chiat/Day had already paid the princely sum of $10 to run “1984” at 1:00 a.m. on December 15, 1983, on a small television station KMVT, thereby ensuring that the commercial would qualify for that year’s advertising awards. In 1995, The Clio Awards added ‘1984’ to its Hall of Fame, and Advertising Age named it as No.1 on its list of 50 greatest commercials.